NASA's New Horizons spacecraft carried out a short, 2.5-minute engine burn on Saturday, Dec. 9 that refined its course toward 2014 MU69, the ancient Kuiper Belt object it will fly by a little more than a year from now. Setting a record for the farthest spacecraft course correction to date, the engine burn also adjusted the arrival time at MU69 to optimize flyby science. Telemetry confirming that the maneuver went as planned reached the New Horizons mission operations center around 1 p.m. EST at the Johns Hopkins Applied Physics Laboratory (APL) in Laurel, Maryland, via NASA's Deep Space Network (DSN) stations in Goldstone, California. The radio signals carrying the data traveled over 3.8 billion miles (6.1 billion kilometers) and took five hours and 41 minutes to reach Earth at the speed of light. Operating by timed commands stored on its computer, New Horizons fired its thrusters for 152 seconds, adjusting its velocity by about 151 centimeters per second, a little more than three miles per hour. The maneuver both refined the course toward and optimized the flyby arrival time at MU69, by setting closest approach to 12:33 a.m. EST (5:33 UTC) on Jan. 1, 2019. The prime flyby distance is set at 2,175 miles (3,500 kilometers); the timing provides better visibility for DSN's powerful antennas to reflect radar waves off the surface of MU69 for New Horizons to receive – a difficult experiment that, if it succeeds, will help scientists determine the reflectivity and roughness of MU69's surface. 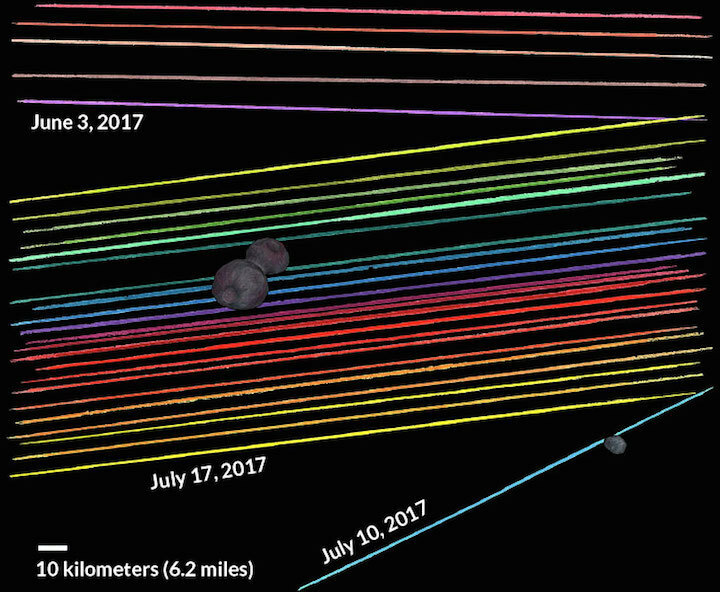 Today's maneuver was the last trajectory correction during the spacecraft's long "cruise" between Pluto, which it flew past in July 2015, and the MU69 flyby. New Horizons Mission Design Lead Yanping Guo, of APL, said the next course-correction opportunity comes in October 2018, at the start of the MU69 approach phase. 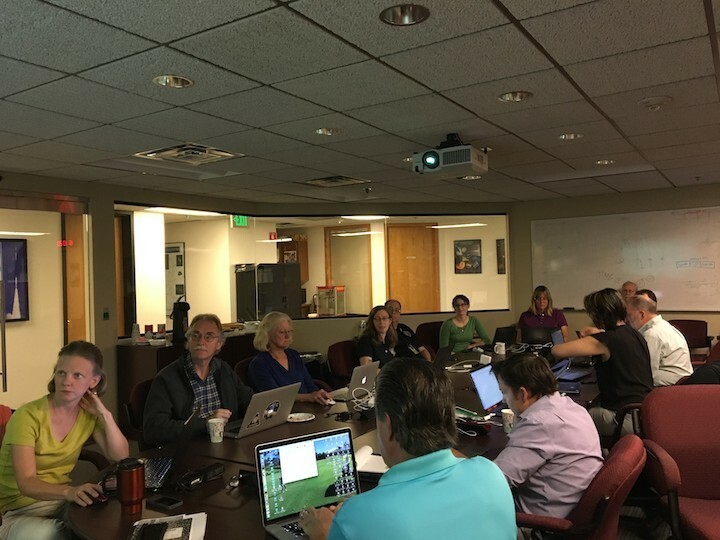 The mission team is using data from NASA's Hubble Space Telescope and the European Space Agency's Gaia mission to hone its aim toward MU69, which was discovered in 2014. "We are on course and getting more excited all the time; this flyby is now barely a year away!" said New Horizons Principal Investigator Alan Stern, of the Southwest Research Institute, Boulder, Colorado. The mission team will put the New Horizons spacecraft into hibernation mode on Dec. 21, where it will stay until early next June. The spacecraft is healthy and speeding away from the Sun at 31,786 miles (51,156 kilometers) per hour, or over 750,000 miles (1.2 million kilometers) per day. WORKING FOR PEANUTS NASA’s New Horizons spacecraft is racing toward a rock in the Kuiper Belt called MU69. Early reconnaissance suggests that the object might be shaped like a peanut (as seen in this artist’s illustration), or could be two separate bodies. NEW ORLEANS — The New Horizons team may get more than it bargained for with its next target. Currently known as 2014 MU69, the object might, in fact, be two rocks orbiting each other — and those rocks may themselves host a small moon. MU69 orbits the sun in the Kuiper Belt, a region more than 6.5 billion kilometers from Earth. That distance makes it difficult to get pictures of the object directly. 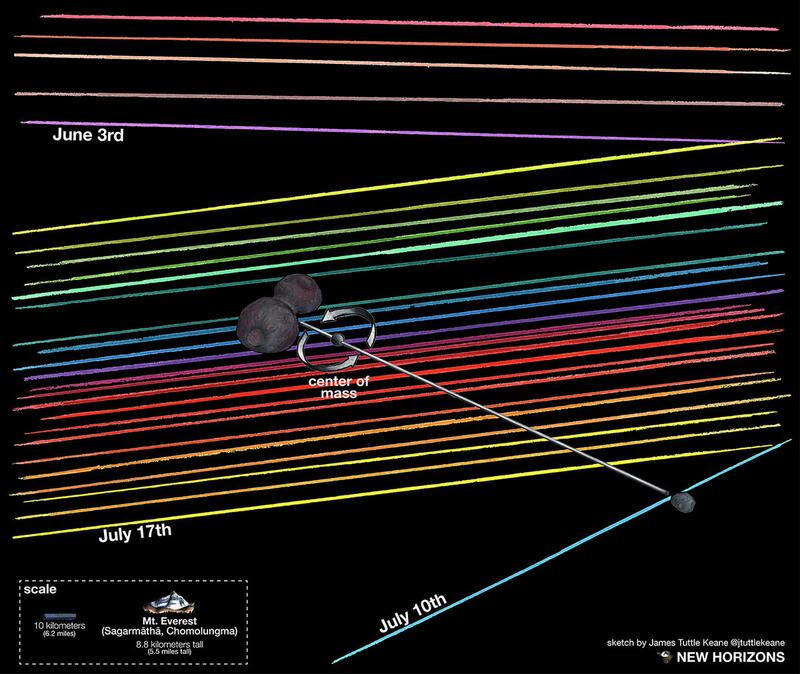 But last summer, scientists positioned telescopes around the globe to catch sight of MU69’s shadow as it passed in front of a distant background star (SN Online: 7/20/17), a cosmic coincidence known as an occultation. Analyzing that flickering starlight raised the idea that MU69 might have two lobes, like a peanut, or might even be a pair of distinct objects. Whatever its shape, MU69 is not spherical and may not be alone, team members reported in a news conference on December 12 at the fall meeting of the American Geophysical Union. Another stellar flicker sighting raised the prospect of a moon. On July 10, NASA’s airborne Stratospheric Observatory for Infrared Astronomy observed MU69 pass in front of a different star (SN: 3/19/16, p. 4). SOFIA saw what looked like a new, shorter dip in the star’s light. Comparing that data with orbit calculations from the European Space Agency’s Gaia spacecraft suggested that the blip could be another object around MU69. 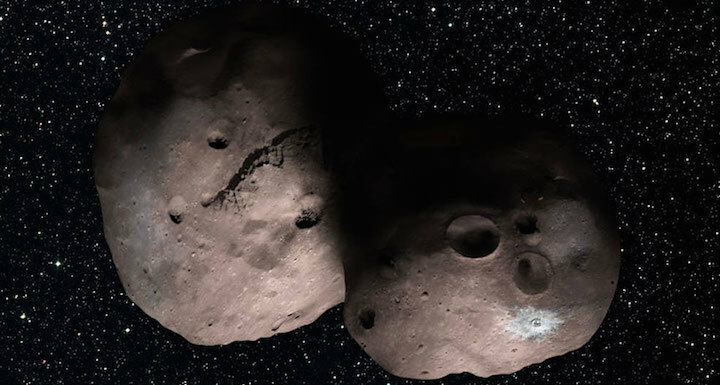 A double object with a smaller moon could explain why MU69 sometimes shifts its position from where scientists expect it to be during occultations, said New Horizons team member Marc Buie of the Southwest Research Institute in Boulder, Colo. The true shape will soon be revealed. The New Horizons spacecraft set its sights on the small space rock after flying past Pluto in 2015, and will fly past MU69 on January 1, 2019. In June and July 2017, scientists looked for MU69’s path to cross in front of a star and block its light. The colored lines represent the paths of the stars moving behind MU69 as observed by different telescopes around the world. Some of these dips in light showed that MU69 (illustrated) might be shaped like a peanut, and one light blocking detected July 10 suggested the Kuiper Belt object has a tiny companion. A year from today, NASA scientists will have a chance to explore a small space rock in the outer solar system. It will be the most distant object ever visited by a spacecraft. KNAU’s Melissa Sevigny reports. The object is located in the Kuiper Belt four billion miles from Earth. It’s the next stop for NASA’s New Horizons, the first spacecraft to capture up-close photographs of Pluto. Will Grundy of Flagstaff’s Lowell Observatory is on the mission team. "We’d really like to see how the solar system formed, and to do that you have go to the places where there are leftovers from that time, and the Kuiper Belt is this large disk of debris outside the giant planets that is chock-full of these objects," he says. Astronomers were able to see the shape of the object by plotting lines of starlight. The star "winks out" as it passes behind the object and its moon. Grundy says not much is known about this object yet. It’s dark red in color and has a lumpy shape. It might be actually two objects in close orbit, and it may have at least one tiny moon. Scientists will celebrate the New Years’ Day flyby from mission control in Maryland next year. The New Year's celebration to usher in 2019 will include an event like no other – more than four billion miles from Earth. In just under a year – shortly after midnight Eastern Time on Jan. 1, 2019 – NASA's New Horizons spacecraft will buzz by the most primitive and most distant object ever explored. 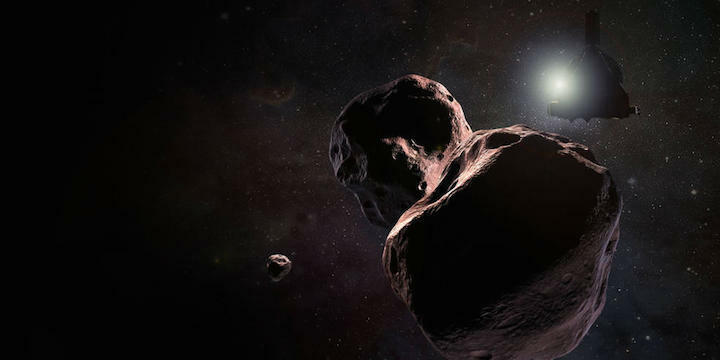 New Horizons' encounter with Kuiper Belt object 2014 MU69, which orbits a billion miles beyond Pluto, will offer the first close-up up look at such a pristine building block of the solar system – and will be performed in a region of deep space that was practically unknown just a generation ago. "The Voyagers and Pioneers flew through the Kuiper Belt at a time when we didn't know this region existed," said Jim Green, director of NASA's Planetary Science Division at Headquarters in Washington. "New Horizons is on the hunt to understand these objects, and we invite everyone to ring in the next year with the excitement of exploring the unknown." "Our flyby of MU69 on New Year's Eve and New Year's Day 2019 will be an exciting sequel to the historic exploration New Horizons performed at Pluto in 2015," added Alan Stern, New Horizons principal investigator from Southwest Research Institute (SwRI) in Boulder, Colorado. "Nothing even like MU69 has ever been explored before." As with the hundreds of thousands of other small worlds in this zone of icy bodies, MU69 is shrouded in mystery. In fact, the all we know about it has come from the Hubble Space Telescope (used to discover the object in 2014) and a comprehensive observation campaign last summer, in which the New Horizons team gathered data on MU69 as it passed in front of three stars. Those observations indicated that MU69 could be two objects, perhaps accompanied by a moon. "That tells us this object is going to have a lot of surprises in store for New Horizons," said Marc Buie, the New Horizons science team member from SwRI who led the observation campaign. "We're going to see something that dates back to the formation of the solar system." New Horizons will fly about three times closer to MU69 than it did to Pluto in July 2015, allowing the spacecraft's cameras to provide a more detailed look at the object's surface. Project Scientist Hal Weaver, of the Johns Hopkins Applied Physics Laboratory (APL) in Laurel, Maryland, pointed out that New Horizons' vantage point from about 2,175 miles (3,500 kilometers) from MU69 will allow it spot details about the size of a basketball court. "Combining images with the measurements we make of the composition of and environment around MU69, should teach us a great deal about objects like MU69 that built dwarf planets like Pluto," Weaver said. The MU69 flyby is the centerpiece of the current New Horizons extended mission that also includes observations of more than two-dozen other Kuiper Belt objects, as well as measurements of the plasma, gas and dust environment of the Kuiper Belt. "This post-Pluto mission is a complete and comprehensive exploration of the Kuiper Belt," said Alice Bowman, New Horizons mission operations manager, also from APL. "The spacecraft is collecting data out there throughout each year while the mission team works together to plan and shape the MU69 flyby." New Horizons is currently in hibernation until June 4. 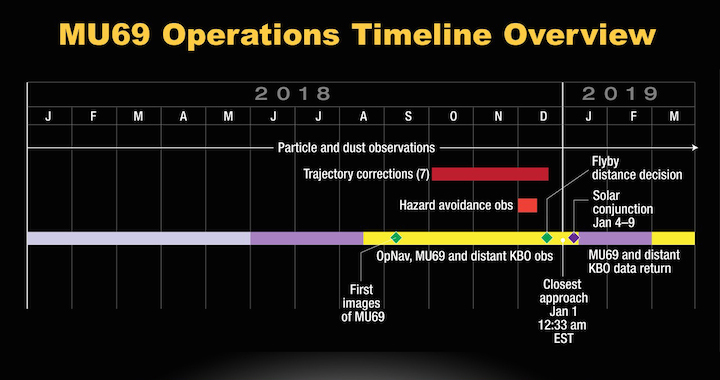 After that wake-up and a check of the spacecraft's systems and science instruments, the MU69 encounter begins in mid- August, with the first attempts at long-distance observations of MU69 that the team will use to navigate the spacecraft along the flyby path. Two and a half years after becoming the first probe to study Pluto up close, NASA’s New Horizons spacecraft is gaining more fame for possessing the solar system’s farthest-out camera in operation. Today NASA released a set of images captured by New Horizons’ Long Range Reconnaissance Imager on Dec. 5 of last year, when the piano-sized probe was 3.79 billion miles from Earth. One of LORRI’s pictures shows the “Wishing Well” star cluster, a scattering of points of light that New Horizons could use for camera calibration purposes. Two hours later, LORRI looked at two objects in the Kuiper Belt, the ring of icy objects that New Horizons has been traveling through in the wake of its Pluto encounter. 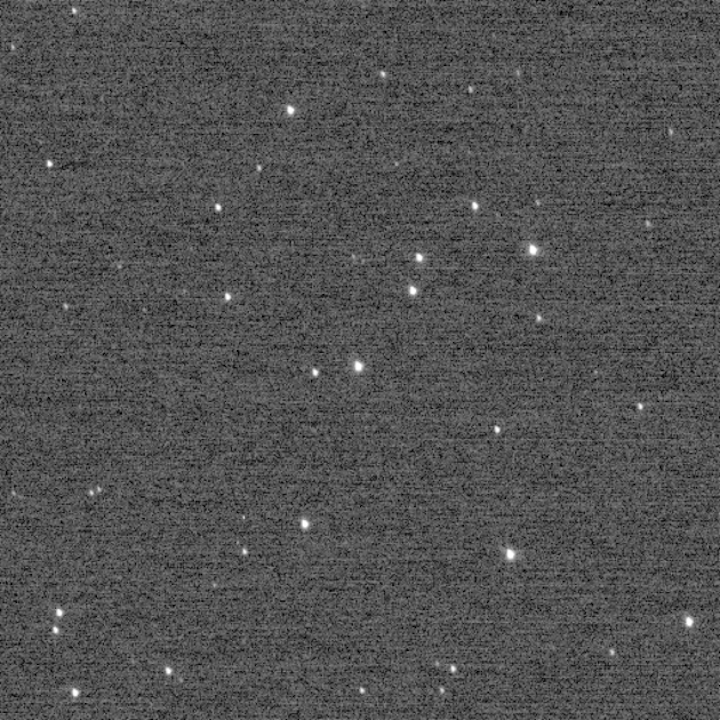 The “Wishing Well” view and those two false-color images, showing the objects known as 2012 HZ84 and 2012 HE85, are what gave LORRI its record as the farthest-out camera. “New Horizons has long been a mission of firsts — first to explore Pluto, first to explore the Kuiper Belt, fastest spacecraft ever launched. And now we’ve been able to make images farther from Earth than any spacecraft in history,” mission principal investigator Alan Stern, a planetary scientist at the Southwest Research Institute, said today in a news release. The record was previously held by NASA’s Voyager 1 spacecraft, which snapped the image data for the famous “Pale Blue Dot” image on Feb. 14, 1990. That picture, the brainchild of the late physicist Carl Sagan, looked back at Earth from a distance of 3.75 billion miles. Voyager’s cameras were turned off shortly afterward and are no longer being used, even though the probe continues to zoom through the solar system’s fringe at a distance of 13.2 billion miles. New Horizons, in contrast, is just getting started. Or restarted. The probe is periodically in communication with the mission team as it closes in on its next target, a Kuiper Belt object (or perhaps even two paired objects) known as 2014 MU69. A Pluto-style flyby is scheduled for Jan. 1, 2019. By that time, 2014 MU69 is almost certain to have a nickname, thanks in part to a naming contest that’s currently in the deliberation phase. For what it’s worth, the most popular choice was Mjölnir, which pays tribute to the hammer wielded by Thor, the Norse god (and Marvel movie star). It remains to be seen whether Mjölnir passes muster with NASA and the International Astronomical Union. In the meantime, we’ll always have 2012 HZ84 and 2012 HE85.